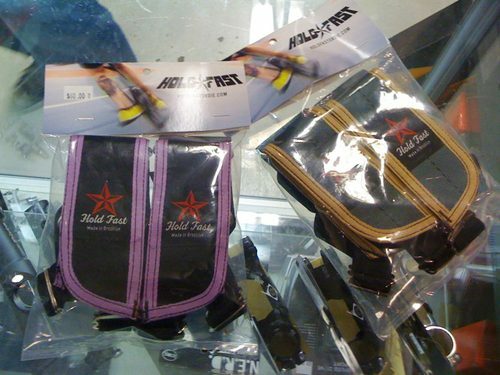 Affinity will be the only shop in Brooklyn carrying Hold Fast’s FRS for the time-being. They got their first batch in yesterday in an assortment of colors. Some of the pairs are a limited-edition military olive and khaki colorway. Each of these military-colored straps are numbered 1-50 and this particular colorway won’t be re-issued, so swoop now! I met up with Jeremiah last week to check them out and they look sharp! Great color combination. Head by Affinity on Friday, pick up a pair and take advantage of their Black Friday sale! I Tweeted / Twittered / Twerped / whatever this earlier tonight. I’ll continue to post updates like this to my Twitter, so be sure to follow me. Other shops stocking Hold Fast in the NYC area are Grove Street Bicycles in New Jersey and Chari & Co in the LES, Manhattan. Chari should be getting their next batch in soon and Grove Street is fully-stocked.